IN 2013 GENTING MADE NEVER BEFORE OR AFTER RM190 MILLION DONATION TO “CHARITIES” CONTROLLED BY NAJIB SHORTLY BEFORE THE GENERAL ELECTION!!! Why did Genting become so “charitable” to Najib and UMNO/BN as never before or after? In 2013 Genting sold its IPP business to 1MDB for RM2.3 billion. 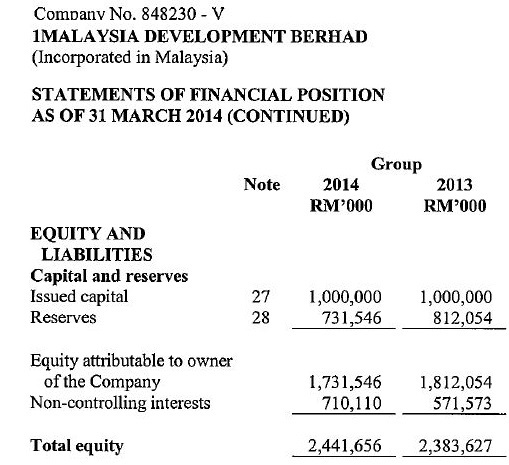 Genting’s 2013 audited accounts show that it made a staggering RM1.9 billion profit on that sale. It’s obvious that Najib and 1MDB conspired with Genting to inflate the purchase price by RM1.9 billion. AND RM190 million is exactly 10% of RM1.9 billion! Coincidence? This fraud was further revealed when, after paying Genting RM2.3 billion for the IPP, 1MDB wrote off RM1.2 billion as permanent loss in value in its 2013 audited accounts! So, now we know where some of the money Najib and 1MDB Foundation spent like water in so-called Corporate Social Responsibility (CSR) ventures to sponsor free Haj trips, gunny sacks of rice, sarongs, bajus etc. to Malays, came from. Let me also expose that fraud further. 1MDB’s Detoilette audited accounts for the year ended 31 March 2014 shows positive Equity (from 2010-2014) of RM2.4 billion. Refer picture below. In actual fact, from a strict cash point of view, 1MDB had negative equity of RM2.6 billion. This is because, to hide the massive RM2.6 billion loss, 1MDB cooked the books by revaluing its land assets by RM5 billion. This resulted in a huge paper profit, but no cash! So, 1MDB never had enough cash from profits to embark on fancy multi-million ringgit CSR Haj giveaways through 1MDB Foundation. All that boasting by Najib & Arul Kanda that 1MDB had contributed a lot to the welfare of citizens, was done by cooking the books, inflating IPP purchase prices and stealing by blatant fraud, over RM19 billion from 1MDB’s funds. At least another RM11 billion is missing from 1MDB’s books, while MoF is hiding behind the OSA to cover-up the SRC/KWAP RM4 billion fraud. Do you really wonder now why Najib sacked the two previous auditors, EY and KPMG? Or why 1MDB appointed Detoilette where Najib’s son is a partner, and it (illegally) withdrew its 2013 & 2014 audit reports and resigned in 2016? Or why MoF is in no hurry to get 1MDB’s accounts written up for 2013-2017 and get it audited? Do you not wonder why, if 1MDB had really made all that profit and has RM51 billion of assets as that conman Najib boasted without a clue about analysing accounts, it was unable from 2014 to service loan interest and capital repayments, required RM975 million bailout from MOF, refinancing of RM4 billion arranged by Ananda Krishnan, and had to sell its IPP business, precious Bandar Malaysia & TRX land? Or why it is the Rakyat (MoF) which will have to bear 1MDB's US$6.5 billion (RM28.6 billion) IPIC debt (again)? This has resulted in 1MDB’s debts mushrooming to RM95 billion reduced by RM10 billion to RM85 billion from sale of IPPs (Edra) for RM10 billion, to CNG China. The fraudulent inflating of all 1MDB's purchase of IPPs was admitted to by shameless, disgraceful and lying CEO Arul Kanda who offered the lame excuse that it was done to prevent TNB from increasing electricity traiffs. CLICK HERE. Of course, as every Malaysian knows, electricity tariffs have never come down. The real reason for all this massive fraud, looting and plundering by Najib and his cronies was to build up a slush fund to get UMNO/BN illegally re-elected, and line Najib & Rosmah's pockets! Please learn to recognize the real traitors in our midst (musuh dalam selimut) – Najib, Jho Low, Rosmah, Riza Aziz, Ismee, Shahrol Halmi, Chairman & BoD of 1MDB, Arul Kanda, AG Pandi, IGP Kebab, PAC Chairman Hasan Arifin, Chief Sec to Govt Dr. Ali Hamsa, MoF Chief Sec Serigar Abdullah, Cabinet Ministers and Najib balls carriers and apologists like Paul Low, Nur Jazlan, Azalina, Kj, Rahman Dahlan, Salleh Syed Keruak, Ahmad Maslan, fake tengku Adnan, MCA, MIC, Gerakan etc., etc., etc. Vote them all out or we are truly finished!